Born and raised in Tokyo, Akio Minakami began his formal martial arts training at age 7 under the 9th Degree Kodokan Judo Black Belt, Takagi Sensei. Minakami moved to the United States in 1967. He won 5 Gold Medals at the 1974 All Japan Karate Championships. In 1983 Minakami received his Shihan Certificate (6th Degree Black Belt) from the governing body for karate in Japan, the Japan Karate Federation (JKF – formally FAJKO). Shihan Minakami was the first individual ever to receive a unanimous passing grade, meaning all 11 Masters representing the 4 major styles on the examining board gave him their approval. He then repeated this remarkable achievement when he graded for 7th Dan. This is an amazing feat for which he will always be known. Minakami is also a Black Belt in Judo, and a 3rd Degree Black Belt in Kendo. He is regarded as one the finest Karate instructors in the world and currently teaches many International Champions. He is fluent in English and able to communicate concepts and philosophies clearly. He is friendly, approachable and an inspiration to karate practitioners of every level and style. Shihan Akio Minakami is once again visiting in July 2013 – please see http://bushidokarate.co.uk/shihan-akio-minakami-8th-dan-uk-tour-july-2013/ for details. 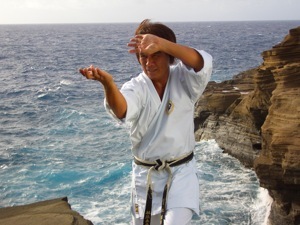 Shihan Akio Minakami is coming over to the UK in July 2012. Please see http://bushidokarate.co.uk/shihan-akio-minakami-8th-dan-uk-tour/ for the training schedule.